Hey everyone - how are you all going with the Guess that Polish giveaway? When I take out some accidental submissions before ladies had finished completing their form, I have 39 entries. I have to say you ladies are pretty clever, but...so far no one has got 40/40 correct! There are handful of polishes that every single one of you has got correct, such as 3, 5, 10 & 19. I'd love to tell you which ones you are all struggling to get right, but I don't want to make it unfair on anyone. I promise I will give you a full list of the polishes when its all over. Keep those entries coming. Tonight I have a mani I created using two colours that look gorgous together. Jade and gold. I started with a base of Picture Polish Jade on all my fingers. On my index and pinky I applied a gradient using Essie Good as Gold. 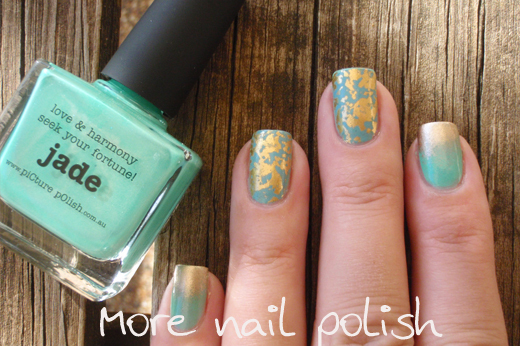 On my middle and ring fingers I applied a nail foil which has the jade and gold pattern on it. Picture Polish Jade was the closest match I had to the base colour of the foil, and I thought Essie Good as Gold was a good match of the gold shade. But when I looked in natural light in the morning I could see they were a different tone. I have to say, I'm currently a little obsessed with nail foils. The last five manis I have worn all included nail foils. It's all because I finally discovered a polish I can use on top of the foils that wont wrinkle them - I can't wait to tell you about it when it's released by Picture Polish. I even went online and purchased a whole bunch of new foils because I'm finally happy with the results I get - and the results last. My foils look as good at the end of the day as they did when I applied them. Yes there are a few which are very similar on your polish giveaway. Was wondering if anyone hit jackpot yet. So good to know Picture Polish have a solution as I've been a long time fan of foils too but even the most carefully applied non-gel topcoats usually aren't always impeccable. Tend to use them only for accents because of it. I was close to getting a science nerd to create a non-crinkle top coat ha ha. Love this color combo, these two shades look awesome together! Foils are so nice, I have a whole bunch at home, but I rarely use some of them because of the wrinkling of the top coats. I am so curious of what the magic top coat is! Do you know when Picture Polish will release it? I don't have an exact date for the polish, which is actually developed for another purpose, it just works great on foils. I think it will be some time in April. The foil looks amazing - how did you do it! Is there a tutorial I can follow? If not, can you make one!? I adore this design. This is lovely. The foils look like hand applied gold leaf! That is so amazingly gorgeous! Now i can't wait for the top coat, either. I don't know how I can wait until the content close date on April 14th, and then the announcement a few days later (well...I guess I can wait if/when we find out someone has 40/40 in the next couple weeks because that would mean that I am toast). Fun challenge though, can't wait to see the results. Lovely mani today!! The foils are great--they accent but aren't too in your face. Have you tried any of the Ciate foil kits? you need someone to send you some? ;) They look fun and pretty at Sephora, and my husband of all people keeps trying to get me to buy a kit, ha ha.